True, I haven’t actually started reading this one yet, but I will later today and I’m really looking forward to it. 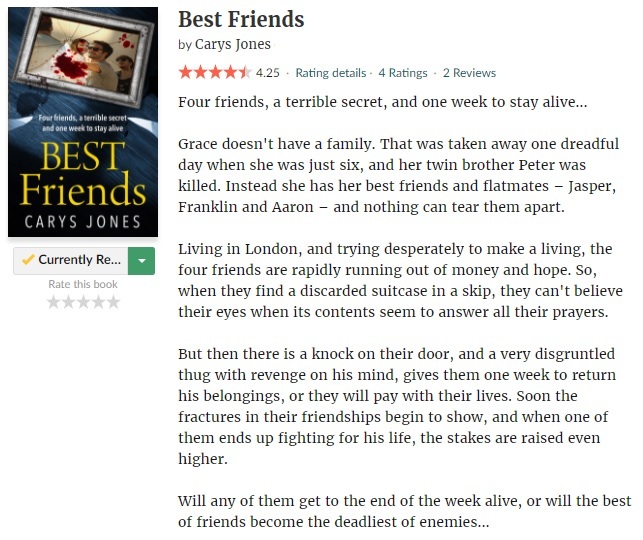 I was intrigued by the blurb when I first saw Best Friends mentioned and just HAD to request a copy… Fingers crossed it’s going to be a good one. This entry was posted in Book Memes, Teaser Tuesdays and tagged best friends, book memes, carys jones, teaser tuesdays by Yvo. Bookmark the permalink. I like the idea of friends and secrets. I hope this turns out to be a good read for you. Happy reading. I am reading, The Woman in the Window and Liars by Frances Vick. Fingers crossed! I’ve heard great things about your current reads; I hope you will enjoy them. Seems like “Grace” is a name in every book I’ve read lately! I’m reading Keep Her Safe and Fractured at the moment. Have a great Tuesday! I know right? It does seem like a very popular name. Enjoy your current reads and have a great day! It’s still early days, but I’m hoping it will be a good one! Great teaser! I really want to reread The Name Of The Wind some day as it is one of my all time favorites. I’ll be posting a review today.